VAC-U- MAX industrial vacuum features manual blow-back filter cleaning with static-conductive PTFE pre-filter and secondary cartridge filter, as well as static-conductive casters. Used for high volume recovery of fine powders and combustible dusts, unit comes with 15-gallon collection drum and ATEX-certified vacuum hose. Unit's maximum suction power is 16” Hg (208” H20), maximum Air Flow of 100 SCFM, and noise levels are below 79 DBA @ 8" Hg. Product is available in anti-sparking stainless steel in 304SS or 316SS bead-blast finish and can be used in food environments. BELLEVILLE, NJ USA - VAC-U-MAX proudly introduces the newest addition to its Industrial Vacuum Cleaning product range for Combustible Dusts, the new MDL15. The MDL15 Combustible Dust Air-Vac features the exclusive VAC-U-MAX Venturi power unit – which offers the lowest compressed-air consumption on the market today. System features a 15-gallon collection drum, and with no expensive electrical components or moving parts, the MDL15 is ideal for high volume recovery of fine powders and combustible dusts – making it a truly “intrinsically safe system”. For more information on the new MDL15 and to preview a video demonstration, visit www.vac-u-max.com/MDL15. The MDL15 features manual blow-back filter cleaning with static-conductive PTFE pre-filter and secondary cartridge filter, and static-conductive casters. Dust, debris, and fine powders are collected in “off-the-shelf” static-conductive polybags, eliminating “the mushroom cloud” that comes with drum dumping. Standard construction includes anti-sparking stainless steel in 304SS or 316SS bead-blast finish, and is suitable for food environments. The MDL15 is equipped with a static-conductive compressed-air hose, ATEX-certified vacuum hose, and complete cleaning tool kit assembly for floors, walls, machinery and overhead cleaning. The Single-Venturi Power Unit offers maximum suction power at 16” Hg (208” H20), with maximum Air Flow of 100 SCFM, requiring 35 SCFM @ 60 PSI. Suction connection is 1.5” in diameter, with compressed-air connection at ½” NPT (Female). Noise levels are below 79 DBA @ 8" Hg. Bonding and grounding requirements meet NFPA 77-2007 "Recommended Practice on Static Electricity". Typical industrial vacuum cleaning applications for the MDL15 include high volume clean-up of powders and combustible dusts from floors, walls, machinery and overhead surfaces typically found in the food, pharmaceutical, chemical and general manufacturing industries. The MDL15 is suitable for Class II, Division 2 environments. 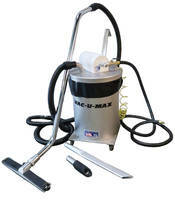 For more information and to preview video demonstration, please visit www.vac-u-max.com/MDL15. Custom Vacuum Grippers provide consistent adhesion.